Despite Media interpretation the London and St.Thomas Market is still very active. With daily listings being posted in numbers (60-120 depending on the day, 112 today) and properties closing on regular basis (62 today), buyers and seller are indeed active. REAL ESTATE'S FIRST MEDIA NETWORK . Podcasts, Flash Briefings, and Video shows for industry professionals. Whether you re in mortgage, title, real estate, or whatever, we have the best content for you. Stay ahead of the curve w/ the most current, helpful, educational, and entertaining content out there. On top of our voice and video content, we will also be providing you great written content on our blog. From marketing tactics, thought leadership, industry influencers, to marketing tips and business development we will have something for everyone. We are agents, loan officers, title, marketers, appraisers, executives, speakers, coaches, from ALL corners of The Industry. This is just the start. We are adding Real Estate Investing, Interior Design, Staging, Insurance, Home Building, and more! Download past episodes or subscribe to future episodes of The MindShare Podcast by David Greenspan for free. 🦅SUPER skilled in the buying and selling process, Mitch brings a wealth of knowledge and strong history of sales and experience with him. .
⚡️Excited to supercharge him with our systems and processes. Watch closely and don’t blink cause you might miss this lightning bolt making his mark in an area near you! 🖋Meticulous, driven with a great attention to detail. 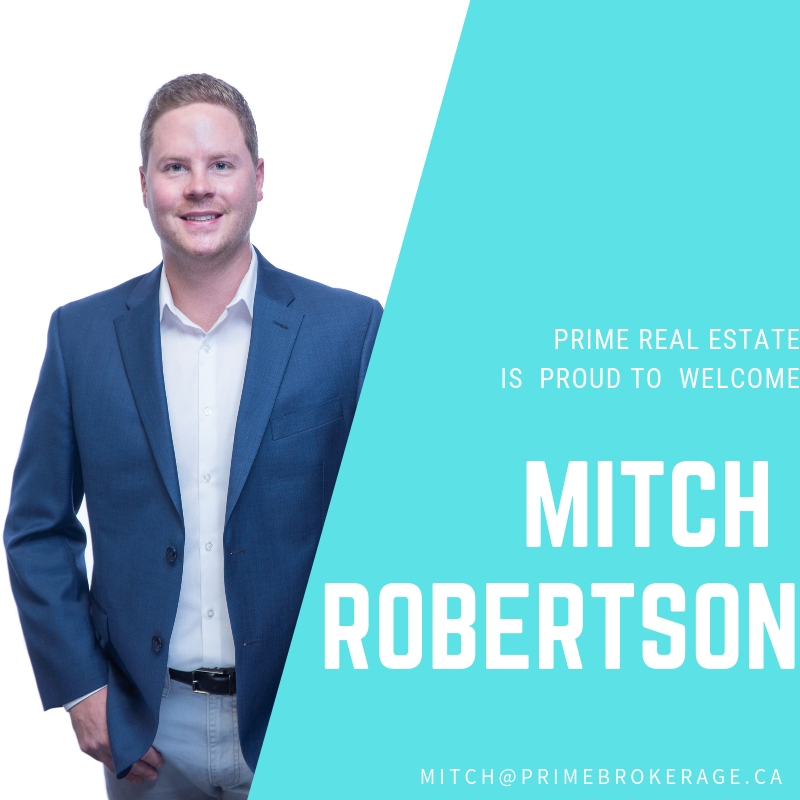 Super honoured and excited to have this skilled agent and friend join our firm and excited to move mountains with him! -Another adventure repping Scott Mcgillivary and Micheal Sarrachini in Niagara falls on behalf of our market. Some insights into why we do what we do at these events. -Mastermind workout with Corey Bannon and some other top performers at Fitclub earrrrrrrly morning. -Hammering through our work week and getting that work life grind on. We've got BIG plans for 2019 and have some wheel in motion for some content that will blow your mind. New partnerships, opportunities and people to introduce to you. We are more motivated than ever to serve our audience and it's only up from here. Your feedback is our OXYGEN! Let us know what you like and things you want us to shoot. This is for YOU! The retail market in London can be tricky to navigate, especially when you need to focus on growing a thriving business while organizing holiday festivities. We got the opportunity to fly to NYC to meet the one and only Ryan Serhant form the hit tv show Million Dollar listing. We documented out travel for you so you can take the adventure with us! Crew travels out of Detroit Metro to JFK. Some insights into the trip, current business, mindset and the personalities we are travelling with. The whole VLOG thing is fairly new to us but hope you have fun travelling with us. Feel free to comment and let us know what you think. Would love some feedback! London and St. Thomas Association of REALTORS® (LSTAR) announced 776 homes* were sold in September, down 6.1% over the same month last year. The number of home resales are above the 10-year average, despite low inventory in the marketplace. All major London centres saw jumps in their average sales price in September. Making the biggest gain was London North, where the average sales price was $498,138, up 28.1% from 2017 and up 70.5% compared to five years ago. In London South (which also includes data from the west side of the city) had an average sales price of $385,635, up 18.0% from 2017 and up 48.8% compared to five years ago. Meanwhile, London East saw an average sales price of $302,452, up 10% from last September and up 51.4% compared to five years ago. It’s only the second time in the last 10 years that London East had an average sales price above $300,000. In St. Thomas, the sales-to-new listings ratio was 107.2%, with a total of 74 homes sold in September, up 8.8% from the same time last year. The average home sales price in St. Thomas was $321,473 up 20.2% from September 2017 and up 69.9% compared to five years ago. This is the highest average sales price St. Thomas has experienced in the past 10 years. The London and St. Thomas Association of REALTORS® (LSTAR) exists to provide its REALTOR® Members with the support and tools they need to succeed in their profession. LSTAR is one of Canada’s 15 largest real estate associations, representing over 1,700 REALTORS® working in Middlesex and Elgin Counties, a trading area of 500,000 residents. LSTAR adheres to a Quality of Life philosophy, supporting growth that fosters economic vitality, provides housing opportunities, respects the environment and builds good communities and safe neighbourhoods and is a proud participant in the REALTORS Care Foundation’s Every REALTOR™ Campaign. *These statistics are prepared for LSTAR by the Canadian Real Estate Association (CREA) and represent a data snapshot taken on October 1, 2018, based on processed home sales activity between September 1 and 30, 2018. 💡HBA from the Richard Ivey School of business. 💰And on of the most creative people we’ve ever seen at saving his clients money. We couldn’t be more honored and proud to have him as head of our Commercial division.We truly believe success begins and ends with the team. Nobody succeed in this business alone, at least not in the long term. We received a number of calls lately on how many commercial buildings we are selling, and leasing, and a lot of it has to do with the infrastructure that we built as a team. Jamie is absolutely crucial to what we do. We get fired up every time we work on a project or creative solution for our clients with Jamie. As with everything else we do, we aim to provide next level service, and cutting edge systems for our clientele and Jamie fits that role and then some. If you’re looking to buy or sell commercial properties, or need a new location for your business, hit us up and will connect you. Go follow him @jamiethecloser on Instagram and watch his adventures there! By properly taking care of your lawn in the fall, you prepare it for a healthy and boisterous start in the spring. In turn, this means less future hassle and less wondering why your lawn isn’t flourishing like it should. So, what should you be doing in the fall? Here are our top fall lawn care tips to get you started! Or use a blower to get rid of them. If you don’t get rid of the leaves before the snow comes, it will kill your lawn. It blocks the light from reaching the grass and traps moisture underneath. Make sure you do this every year! Keeping the leaves in check is step 1. Step 2 is keeping up with the mowing and watering of your lawn. The grass doesn’t necessarily stop growing with slightly cooler weather. In fact, it may continue to grow up until that first frosty night. Regularly mowing will keep your lawn healthy. Further, if rain isn’t in the forecast, continue to water your lawn. A lot of people make the mistake of quitting mowing and watering too early - then they wonder where they went wrong come springtime. Fall aeration is ideal. It prevents the soil from becoming too compacted, and also helps keep your lawn in tip-top shape by allowing ways for fertilizer and water to get through. Try to make aeration an annual affair. If not every year, aim for at least every 2 years to get your lawn aerated. Not many people are aware that fertilizing your lawn in the fall is just important as fertilizing it in the spring. It sets you up for a healthy lawn come springtime of the following year. Get into the habit of doing this in the fall, as well as the spring. Pull up any weeds leftover before the snow and frost set in. And make sure to add new grass seeds to encourage growth in the spring. It will also help prevent those bare and unhealthy patches from forming after the snow melts. Properly closing your irrigation system before the freezing winter temperatures come is one of the most important components in maintaining your irrigation system. Make sure to follow the above fall lawn care tips to achieve a healthy and hassle-free lawn come spring. Your future self will thank you for it! The average May sales price in London and St. Thomas was $366,096 up 6.4% over May 2017 and up 28.4% over May 2016. By geographic area, London South was $370,851 up 4.4% from last May. In London North, average home sales price was $451,556 up 4.7% compared to the previous year, while in London East, it was $291,359 an increase of 11.1% from May 2017. In St. Thomas, it was $288,723 up 11.2% over last May. "The big trend we continue to see in the marketplace is low inventory, which remains at its lowest level in 10 years," Nethercott said. "In May, there were 1,643 active listings, down 7.7% from this time last year and down 44.6% from May 2016. The sales-to-new listings ratio was 70.8%, which the Canadian Real Estate Association (CREA) says represents conditions in the marketplace that favour sellers. With warmer temperatures and summer around the corner, it's a great time to contact your local REALTOR® if you're considering selling your home." St. Thomas saw a total of 100 homes sold in May, down 12.3% from the same period last year. For inventory, there were 82 active listings, down 28.1% from last May and down 49.7% from May 2016. So, the market's getting crazy again. We covered that in yesterday's episode. The multiple offers are back, limited inventory is driving buyers to be a little bit emotional. We we're gonna give you guys a tip on how to navigate a seller's market. And the first tip we're gonna give you guys this week is gonna be, don't get caught up on the list price. So list price is put there by the listing agent to generate interest. Sometimes they're listing at market value, sometimes above, sometimes under. A lot of times in the seller's market they are doing it under market on purpose to generate as much interest as possible. The more offers they get, the more likelihood that they're gonna get above-market value with no conditions. Which is a dream for any seller out there. So say a property is worth 300 and they price it at 280, some of the people going in and writing offers on that property are gonna get stuck mentally on the 280, when the smart agents that are out there are gonna look at the property value and see where it's actually gonna sell. So just be aware of what the property is worth and don't necessarily get caught up on the listing price. 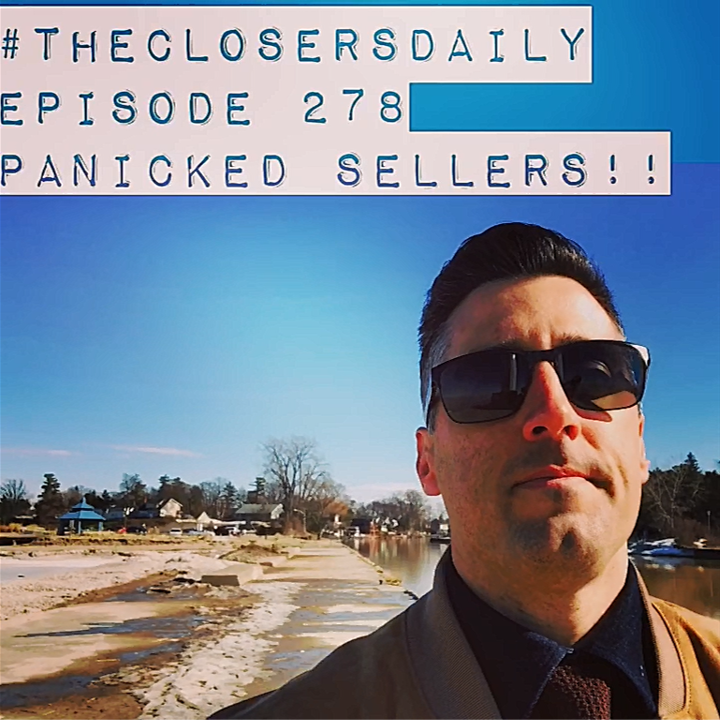 #THECLOSERSDAILY : EPISODE 280: HOW IS THE MARKET? So the question on everybody's mind right now is how is the market? We got another viewer request, and this is something that's coming up in day to day conversations because people didn't know where the market was gonna head. Well, if you really wanna know, you're gonna wanna watch out full blown Market Update. They're typically anywhere from 20 minutes to 45. Guest questions and everything else this week, so make sure you jump over to our Facebook page. But short and sweet, it's getting crazy out there again. So last year, if you were paying attention January 'til about June-ish, the market went bananas in London and surrounding area. And whether you're in London specifically or you're within that range, you're gonna wanna pay attention to what's happening over the next two to three weeks. Now that the weather's cracked, we're starting to see everything going multiple offers, inventory shrinking, so pay attention 'cause I think things are about to get even crazier. Hi everyone, it's Mandy from Mortgage Wise Financial. 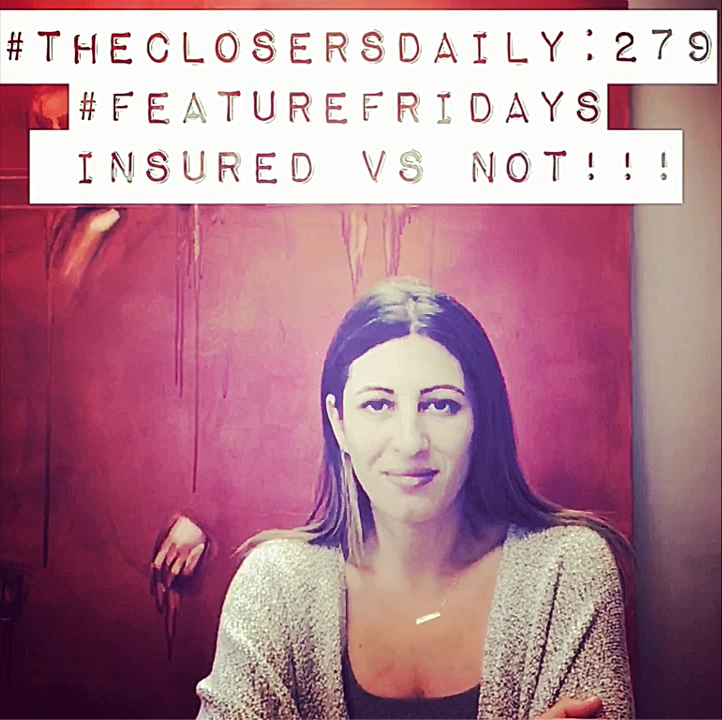 Justin Konikow from The Closers asked me to reach out and touch on a topic that some of his clients and my clients have been asking, what is the difference between an insured and a conventional mortgage. So here you have it, an insured mortgage is protected by CMHC Genworth Canada Guaranty, therefore meaning that the lender is protected. A conventional mortgage isn't, therefore meaning that you may see a little bit higher rates with your conventional mortgage. Guys, if you have any questions, please reach out to me or the guys as Mortgage Wise Financial. We'd love to help you out. So what do you do if you have a house to sell but you found the perfect place that you wanna move to and you don't wanna risk not being able to sell your house? Well, what you do in real estate typically is include what's called a condition of home sale clause. This clause gives you the ability to firm up on a deal but still have an out where if your house doesn't sell, you can escape the contract and walk away from the deal. What the seller's likely gonna include is what's called a 48 hour waiver clause meaning that they can continue to market the property, and if they accept another offer, you have 24 or 48 hours, whatever you negotiate to firm up on your original deal. Now, we had a question from an audience member is if I locked up a property for let's say 400 and then somebody comes in and pays 500, doesn't that mean that I'll have to pay more? No, your escape clause is for you. So if you waive that clause, deal goes firm, you get it at 400, and you'll have a super upset seller knowing that they coulda got more money. Now, you have to determine is it worth risking waiving that clause, and is your property still gonna sell? Part two coming tomorrow. Investing in Real Estate is one of the most proven ways to build wealth. From your first investment property, to your multi family portfolio, apartments, commercial, land development and beyond we’ve got you covered. Our firms Investment division not only leads the market in terms of experience, knowledge and proven track record, but proprietary systems hold unique advantages in terms of deal flow, analysis and protecting our investors. Fun fact: We are EXCLUSIVE representatives in our territory for KEYSPIRE - Founded by HGTV’s Hit TV show Income property’s Scott Mcgillvarry and Micheal Sarrachini. Keyspire is Canada’s one of Canada’s leading Real Estate Investing Education and Networking Group that is constantly innovating and providing value across North America. Chose to leverage our database of Investors to sell your property or use our proprietary buying system for both on and off market properties to get the edge in Real Estate Investing. 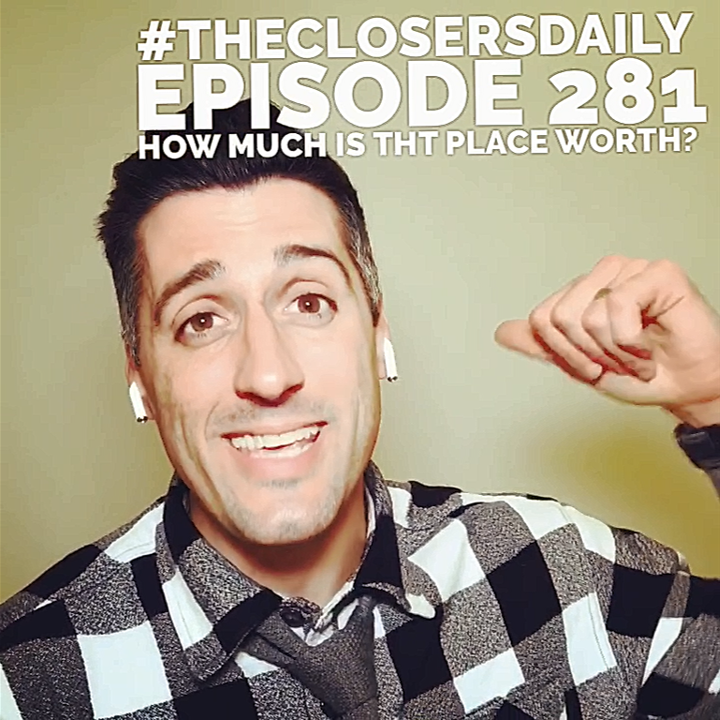 #THECLOSERSDAILY : EPISODE 276: IS #THECLOSERSDAILY OVER? So you may have noticed we didn't shoot The Closers Daily for three days. We actually got a DM from one of the audience members asking us if the show was over, and no, it's not. We actually wanna tie it into this episode, and what it has to do with is making sure you're taking time to take care of things in your life other than just the work side of things or things you are maybe super passionate about like we are with real estate. You know, we had the long weekend. We had Family Day on Monday, and we had Saturday and Sunday, and typically what we do is we'll post a Closers Daily Monday to Friday. We actually have a tweak in the programming coming up you guys'll be really excited to see in the next couple weeks. But in the interim, we actually take holidays and the weekends off for two reasons. One, we wanna make sure that we do have that focus time with our families. You know, the team is always working, always out there doing stuff, but you gotta take that downtime and make sure that you're recharging your batteries, and you know what? We end up getting more ideas in our downtime than we do even working in the field day to day. So hopefully that answers your questions. Stay tuned. We have some fun stuff coming for you guys.